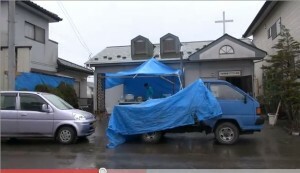 Here is a video showing some scenes from the cleanup at Ofunato Baptist Church in Iwate Prefecture, Tohoku region, Japan. Volunteers from OMF and CRASH are helping to restore this church as a place of worship. Like many churches in Japan, the congregation is tiny. This church has only four regular members plus a couple of seekers. Pastor Chiba holds worship services at the church in Kesennuma on Sunday mornings and then drives up the coast to Ofunato to hold afternoon services here. Please join me in praying for this church, the pastor, and the community in Ofunato.